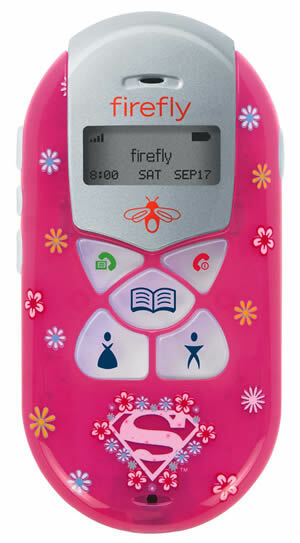 Let me start by saying that your father and I have agreed it will be a long time before you have a phone that does much more than this..
That’s right..this little baby by Firefly has a button for calling Mom, Dad, 911, and an option for a few more numbers that mom or dad program in. No texting, no fancy camera, and definitely no internet. Go ahead and throw your fit now. It’s true your dad and I feel it is our job to protect you from yourself as long as we can. I don’t know who decided that giving 11 and 12 year olds the internet and cameras right in their pocket is a good idea. As a marketing concept I suppose it’s great, but as a save your innocence and your self respect concept it’s HORRIBLE. Please dear daughter never let me catch you involved in the current trend of “sexting”–and I can only imagine the options available to hormone raged teenagers by the time you get to all of eleven years old. There is nothing classy about showing off parts of your body to random guys or even some boy friend you won’t be allowed to have when you’re 13. It would be even worse if said picture some how ended up in the hands of ALL your peers when you break up with the saggy pants loser, love of your life, boy friend of the month because you guys couldn’t agree what your “song” should be. When your father and I finally give in and get you a “real” phone, when you’re 30 sixteen or so, please use it responsibly. Use it in a way that won’t allow someone else to hold your self respect in their hands. Use it to call and talk to your best friend late into the night–not send pictures of yourself to some dude who shouldn’t see any of you unclothed ever until you’re married. #73 Tease your sibling a little – and love them a lot!